Before I get to today's action at the ITF Grade 1 International Spring Championships, here's the link to the March Aces column at the Tennis Recruiting Network. As usual, there's a substantial number of former collegians featured, as well as some impressive ITF World Tennis Tour results from juniors, both American and international. The 16s finals are set for Saturday at the Dignity Health Sports Park, with a Southern Californian certain of taking the girls title. Irvine's Anne Lutkemeyer, the defending champion, will face La Mesa's Winta Woldeab after the pair won their semifinal matches Friday in contrasting fashion. Lutkemeyer, the No. 7 seed, needed nearly three hours to get past No. 6 seed Ria Bhakta 7-5, 3-6, 6-2, while Woldeab made customary short work of her opponent, Makenna Martinez, 6-1, 6-2. Woldeab has not surrendered more than two games in any set and only 12 games total in her first five victories. Woldeab is the younger sister of Siem Woldeab, who won the boys 16s title in 2017. As a seed, Lutkemeyer had a bye in the first round but she too got through to the semifinals without dropping a set, until she ran into Bhakta, coming off the 14s final at the Easter Bowl. The boys 16s final will feature William Cooksey, a two-time Division 4 Michigan High School champion, against Alexander Chang of Berkeley California. Cooksey defeated Chang 7-5, 6-3 in the back draw of the Easter Bowl last week. Cooksey beat Eli Gordon 6-2, 6-2 in today's semifinals, while Chang, who has yet to lose a set in his four wins, downed Jiaxi Ma of China 6-3, 6-4. None of the boys semifinalists were seeded. Four unseeded players, including two wild cards, have advanced to Saturday's semifinals of the 18s division. Katrina Scott continued her impressive tournament, with the 14-year-old taking down her third seed today, beating error-prone No. 7 seed Linda Fruhvirtova of the Czech Republic 6-0, 6-3. Scott will get another test on Saturday, against defending champion and top seed Hurricane Tyra Black, who beat No. 12 seed Emma Jackson 6-1, 6-0. Jackson had beaten Black last week in the third round of the Easter Bowl. Black and Scott met last year at an ITF Grade 4 in Florida, with Black winning 7-5, 6-3. 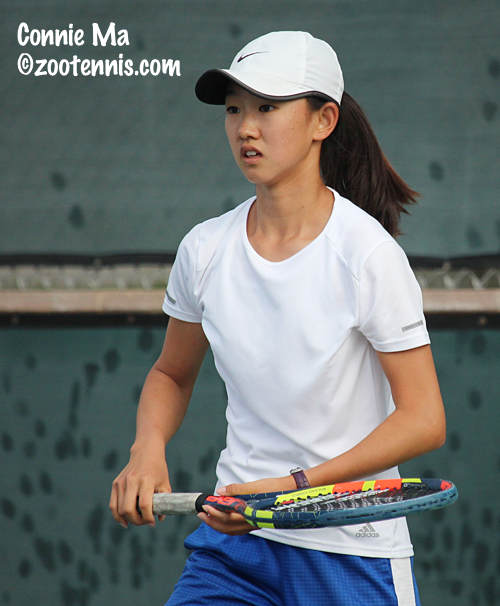 The girls semifinal in the bottom half features wild card Connie Ma against No. 13 seed Robin Montgomery. No. 8 seed Lauren Anzalotta of Puerto Rico had two set points in the first set, serving at 5-4, 40-15, but Easter Bowl finalist Montgomery picked up her level when under pressure and sustained it, taking a 7-5, 6-3 victory. Ma, the reigning 18s Winter Nationals champion, defeated No. 14 seed Jenna DeFalco 6-2, 6-4. Ma was up 3-0 and serving in the second set, but lost three straight games before breaking DeFalco to regain the lead. "I think that break was pretty critical," said the 15-year-old Ma, who blamed that poor stretch on her own unforced errors. "If she won that game I don't know what was going to happen after that." Ma still attends regular school, so her competitive schedule is limited, but she is 29-2 since last year's International Spring Championships, with the only two losses to ITF Junior Circuit stars Coco Gauff (at the USTA 18s Nationals in San Diego) and Daria Lopatetska of Ukraine (at the US Open Juniors). This is just her third ITF Junior Circuit tournament. Ma said she has not played Montgomery before, but was aware of her run at the Easter Bowl. "I think she plays pretty aggressive, but I haven't watched her play much, to be honest," Ma said. As for her own game, Ma names movement and timing as her chief strengths, and as to what she would like to improve, Ma cited her "serve, and transitioning from defense to offense and offense to defense." In the boys semifinals, top seed Liam Draxl of Canada will face No. 12 seed Andrew Dale after both scored straight-sets victories Friday. Draxl lost his break in the first set against No. 5 seed Toby Kodat, but found his form in the tiebreaker and cruised from there to a 7-6(1), 6-1 victory. Dale was down to No. 13 seed Jacob Bullard, who served for the first set at 5-3, but Bullard didn't win another game, with Dale claiming a 7-5, 6-0 win. Dale and Draxl met last fall in the second round of a Grade 2 in Canada, with Draxl winning that match 6-2, 6-2. The bottom half semifinal will be an all-Southern California affair, with wild card Zachary Svajda against unseeded Stefan Dostanic. San Diego's Svajda, who had lost only one game in his previous two wins, did not have to take the court today, with Marcus McDaniel withdrawing due to a back injury. Dostanic defeated No. 8 seed Blu Baker of Great Britain 6-3, 4-6, 6-2 in the only 18s semifinal match to go three sets. "When I was up a set and a break, I feel like I strayed away from my game," said Dostanic, a 17-year-old from Irvine. "I was winning when I was coming to net, pushing him around, then finishing at the net with my volleys. In the second, I just tried to win from the baseline, and he's a very solid, very consistent player, so all the points were from the baseline. But in the third, I told myself to go back to my game, and I did a lot better." 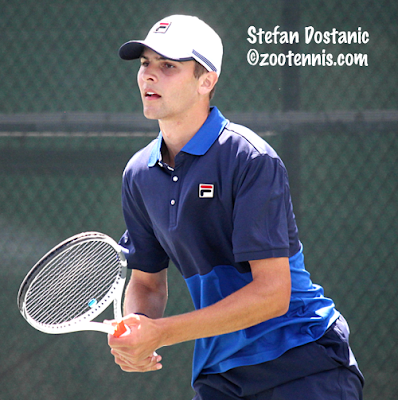 Dostanic said he and Svajda go back many years in Southern California junior competition. "Me and him go back to the 8s honestly in SoCal," Dostanic said. "We played a lot growing up, probably 15 times. I haven't seen him in a while, but he's doing very well, so it should be a good match. He's had some pretty short matches, so he'll be ready." The doubles finals in both age division are scheduled for Saturday. In the 16s, Cooksey and his partner Jeffrey Etterbeek, will play No. 4 seeds Lucas Brown and Alexander Karman. Cooksey and Etterbeek defeated No. 3 seed Ryan Morgan and Jake Vassel 7-5, 6-4 in the semifinals, while Brown and Karman come back to take a 4-6, 6-3 10-7 win over Chang and Cooper Williams. The girls 16s doubles championship match will feature Ava Krug and Tsehay Driscoll against Martinez and Maxine Murphy. Martinez and Murphy defeated Julia Fliegner and Nataly Kader 6-2, 7-5; Driscoll and Krug topped Parker Fry and Sofia Zaprianov 6-2, 6-1. In the 18s, top seeds Kodat and Martin Damm reached their second straight final, with the Easter Bowl runners-up beating unseeded Dostanic and Bullard 6-3, 4-6, 10-5. They will play unseeded Welsh Hotard and Braedan Ho, who saved a match point in their 6-3, 4-6, 11-9 win over No. 6 seeds Blaise Bicknell and Ronan Jachuk. Natasha Subhash will defend her title in the girls 18s doubles final, this time with partner Kacie Harvey. Subhash, who won with Katie Volynets last year, and Harvey defeated No. 4 seeds Savannah Broadus and Vanessa Ong 6-3, 6-4 in the semifinals. They will play No. 8 seeds Ellie Coleman and DeFalco, who beat unseeded Holly Fischer of Great Britain and Skyler Grishuk 7-6(4), 7-6(5). Coleman and DeFalco, who saved set points on deciding points in both the first and second sets, trailed 5-2 in the second set tiebreaker before winning the final five points of the match. Saturday's order of play is available at the tournament website.